President Andrews congratulates recipients of the 2017 Presidents Players Awards. National University’s focus on serving adult learners and a diverse student population is what drives our dedication to continue innovating in the higher education space. 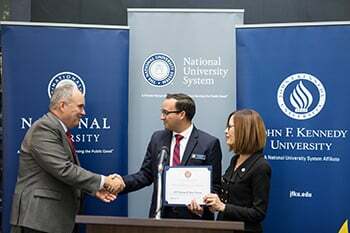 We believe strongly in supporting the goals and dreams of lifelong learners, and as the founding institution of the National University System, we are fortunate to have great partners in this endeavor. As we pursue new ways to innovate in this space, we have been exploring data-driven and high-tech approaches, such as through the Precision Education initiative that is identifying, researching and creating new forms of personalized learning. We also have been looking at our different regions and evaluating the best way to reach our students geographically so that they, too, can have access to a quality education that is aligned with the workforce needs of the communities they live in. As you may recall, we previously announced plans to open a new campus in Pleasant Hill through a colocation arrangement with John F. Kennedy University, which is also an affiliate institute of the National University System. This past week, we marked the formal launch of NU East Bay with a ribbon cutting ceremony. 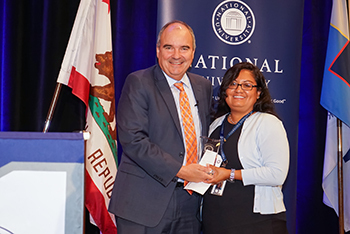 I had the chance to celebrate this momentous occasion with National University System Chancellor Michael R. Cunningham, John F. Kennedy President Debra Bean and her staff and faculty, members of the board of trustees, and East Bay dignitaries. NU East Bay builds on our earlier work this Spring that brought teacher education programs to the East Bay, and we look forward to this opportunity to collaborate on expanding assess to our quality programs through this innovative partnership. Please read our press release for more information, and check out nu.edu for more information about programs that will be offered through the campus. NU alumnus Taurean Clark shares his life and academic journey with NU staff at the 2017 Fall Staff Summit. The Precision Education initiative also continues to build momentum since our formal launch this summer, and we were pleased to welcome Dr. James Stigler, a professor of developmental and cognitive psychology at UCLA who joined us for a special lecture Sept. 27 on the topic of “Teacher for Understanding” as part of the Distinguished Speakers Series led by the Precision Institute at National University. Dr. Stigler has been named our inaugural Institute Fellow, and he will be collaborating with us to further the Institute’s goals of research-based development of personalized education approaches to higher education. I am excited to announce another new initiative that aligns with Precision Education, the National University Scholars Program. This is a scholarship and educational program that recognizes students who demonstrate potential for high achievement and contribution to society with a special emphasis on leadership, service, scholarship and academic excellence. The NU Scholars Program provides a number of specialized opportunities such as ambassadorship, study abroad and an academic scholarship. President Andrews and President Bean of John F. Kennedy University celebrate the launch of NU East Bay. As National University continues to evolve, it’s always satisfying to recognize the great work of our dedicated staff and faculty and our inspiring students. 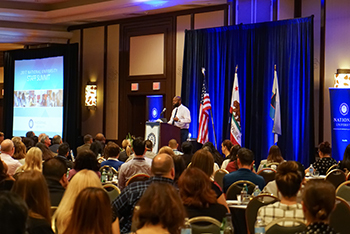 Our recent Academic Assembly Staff Summit and alumni mixer were once again a chance to be inspired by the work you all do and to look forward to what the future holds. Thank you all for making National University such an exciting place to be.